Mary Ellen Heacock and Patty Rice Groth attended the Ohio Association of Garden Club’s convention held in the lodge at Maumee Bay State Park. During the 2 ½ day event, Heacock was installed as director of OAGC Region 7. Region 7 includes affiliated garden clubs Crawford, Richland, Wyandot, Morrow, Marion, Ashland and Knox Counties. Educational sessions focused on healthy eating from the garden. With God all things are possible. 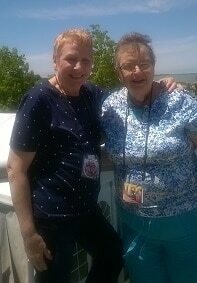 Mary Ellen Heacock and Patty Rice Groth attended the Ohio Association of Garden Club’s convention held in the lodge at Maumee Bay State Park. During the 2 ½ day event, Heacock was installed as director of OAGC Region 7. Region 7 includes affiliated garden clubs Crawford, Richland, Wyandot, Morrow, Marion, Ashland and Knox Counties. Educational sessions focused on healthy eating from the garden.